When Tracy came to me for a cake, she had a great idea: an 80s cake because her brother and sister-in-law grew up mostly in the 80s. She had some great ideas. She remembered her brother’s obsession with a Spud’s MacKenzie shirt that he wore down, Phan Jam, Michael Jackson, and more. But then we realized – we have to incorporate Colleen, too! The couple has a great history together ranging back to high school. 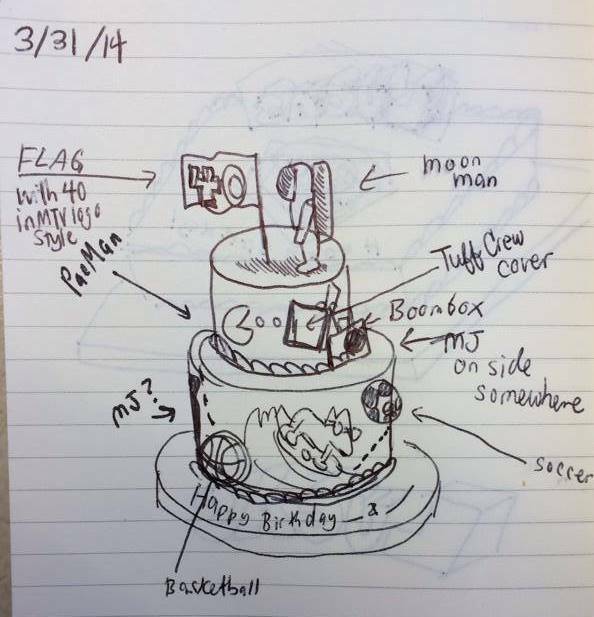 When Tracy told her family of the cake, it evolved into something more. MTM moon man and flag: This went along with the original 80s theme. Spuds MacKenzie: This party animal was a bit before my time. I had never heard of him. He was the dog for Bud Light back in the 80s. Like I said earlier, Chris wore his Spuds MacKenzie shirt down to threadbare, lol. Here is Spud’s Wikipedia page if you are curious or confused or can’t remember: http://en.wikipedia.org/wiki/Spuds_MacKenzie. 80s boom box and Pac Man: Went with the original 80s theme. Tuff Crew’s “Phan Jam” album cover: Chris loved this group. I haven’t heard of them! He listened to it endlessly. Cardinal O’Hara and Widener Logos: The couple met at COH and also went to college together at Widener. Army flag: Chris was in the army. Racing flag: I actually don’t know the story behind this besides one of them (or both) likes racing. 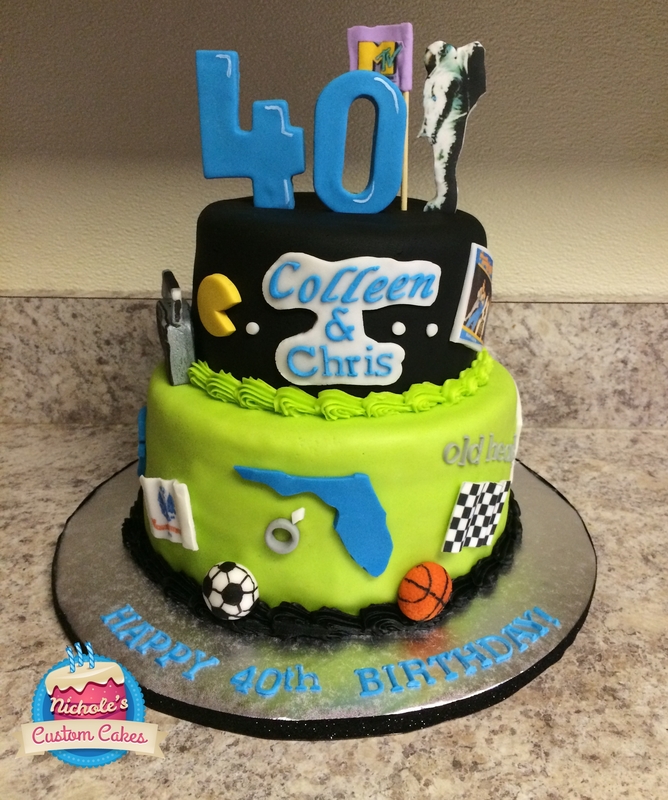 Soccer and basketballs: Colleen played these sports in school. 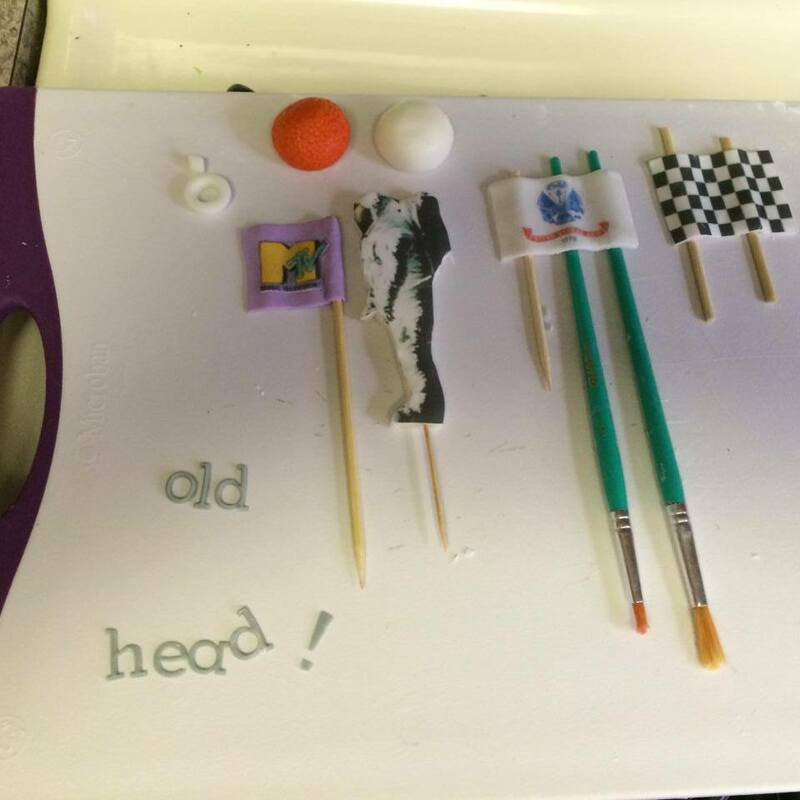 “Old Head”: In typical younger-sister fashion, this is an affectionate nickname that Tracy has for her brother. 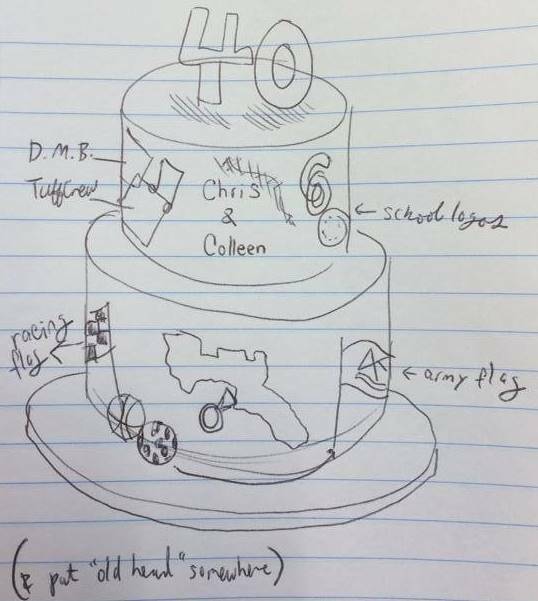 Dave Matthews Band “Under the Table and Dreaming” album cover: Colleen is a big DMB fan! I put it near Phan Jam because I thought that would be a fitting design idea. Florida with an engagement ring: This is my favorite part, which is why it’s front and center. And it’s so important. The couple got engaged in Florida! So that is the story of this cake. I had so much to include and at first it seemed impossible. I tried to make everything as symmetrical and organized as I could because I didn’t want it to look too cluttered. FONDANT TROUBLES: When I made my vintage shoe cake, my fondant rolled out perfectly. It was cool and there was no humidity. But the weather is changing and we don’t have our air conditioner in yet. It was extremely difficult to get my cakes covered this time. 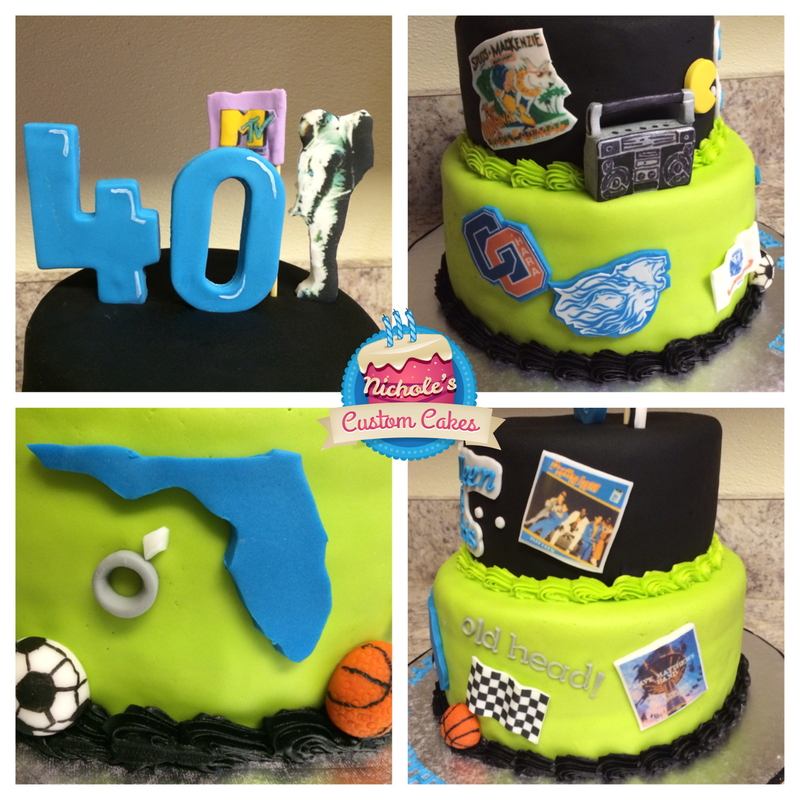 I almost thought at one point that my cake was going to wind up on Cake Wrecks! But, thankfully, I managed to save it (I think!). I am glad I’m not covering any more cakes in fondant for a while. Though, soon we will have the air conditioner in and that will help. BLACK ICING BORDER: When I have to make black buttercream, I start with chocolate buttercream and add Wilton black icing color until satisfied. I keep in mind that the color will deepen. And it didn’t taste horrible, either. Tasted like chocolate! OTHER COLORS: The electric blue and electric green are Americolor. The black fondant is Wilton black fondant. The green fondant is my semi-homemade LMF fondant by Arisan Cake Company.